Page Jump: ========== 1 - An underground world where you fight for survival 2 - Further gameplay impressions and final score. Scavenging, blood thirsty creatures roam the Earth’s surface following an apocalyptic event that has driven mankind underground. Raised in one of the Metro Station Cities you play one of the Russian survivors as you seek to protect your world from the outside threat. Metro 2033 combines FPS and RPG gameplay to deliver a sci-fi storyline based on the works of acclaimed Russian novelist, Dmitry A. Glukhovsky. 4A-Games deserves a lot of credit for bringing Glukhovsky’s world to life with some style. The bleak, oppressive setting of the grubby underground Metro Stations and the inhabitants that breath life into the cramped settlements creates a thick atmosphere that carries throughout the game. 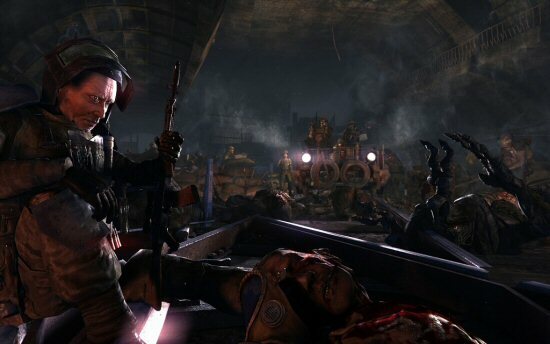 Metro 2033 has a survival horror feel and you do get that sense of fear and desperation from its inhabitants. The majority of the gameplay takes part underground. Though the game is linear there’s plenty of opportunity to explore off the beaten track where you’ll find yourself scavenging for ammo, the game's currency and much-needed survival tool. 4A-Games has throw in an interesting dilemma and a few twists to the standard FPS formula. Ammo is extremely important for survival. Not only does it help you to kill mutants that threaten your community, but it’s also used for buying the likes of weapons and med-kits. The twist is that you'll find hand-made ammo and Military Grade ammo. With the latter you’re able to kill creatures more efficiently, but you also need it to trade. Hand-made ammo kills enemies but it takea longer to eliminate them, thus leaving you vulnerable to, er, death. This is just one of the choices that you have to make alongside some moral ones, such as deciding whether to give ammo away to a child whose father is ill so that he can buy medication. The moral choices that you make do affect the final outcome. The pacing of the game is a real highlight. You're given time to soak up the atmosphere, explore and partake in exploration and conversations before getting involved in fast-paced fights against mutant. There are some impressive set-pieces and QTEs that effectively get you involved in the action. There's also a few other well implemented ideas that set it apart from being a standard FPS, such as having to keep an eye on your watch for when your gas-mask might run out, or stealth-based sections where you might have to sneak along in the dark watching out for booby traps, or broken glass that might alert the creatures to your whereabouts.